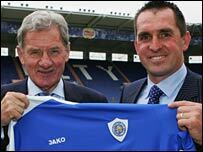 Leicester City have appointed Martin Allen as their new manager. Former MK Dons boss Allen signed a three-year deal after Foxes chairman Milan Mandaric was given permission to speak to him earlier in the week. The 41-year-old has edged out current caretaker boss Nigel Worthington, Neil Warnock and Paul Ince to the post. He took MK Dons to fourth place in League Two this season, where they lost out in the play-offs to Shrewsbury, and impressed at Brentford before that. Allen said: "I'm honoured and privileged to take on the challenge of getting this team to win and to see us fulfil the ambitions of the chairman and fans. "Having enjoyed some good times in the Conference, League One and League Two I feel ready to make the next step. "I can see the stadium being sold out on a regular basis to fans who can enjoy supporting a team with passion and players who are proud to wear the shirt." In two years at Griffin Park, the former QPR and Portsmouth player turned the Bees from relegation strugglers into promotion hopefuls. He has never managed at Championship level before, having also taken the helm at then non-league Barnet, but the Foxes will hope his managerial success to date helps them improve after a poor season in which they finished 19th in the table. Worthington took over as caretaker manager of the Foxes in April after the departure of Rob Kelly and helped steer the club away from relegation. And Mandaric expects a change in fortunes at the Walkers Stadium and has promised Allen funds to strengthen the Foxes squad. He said: "This is a significant appointment as the club prepares for widespread changes that will bring on-field underachievement to an end. "I needed someone with hunger, drive, commitment and potential to aspire to our dreams and Martin ticked the boxes. "His undoubted ability is matched only by his infectious enthusiasm which will inspire the club. "Last season's campaign was painfully unacceptable and significant investment in the first team is a priority. Martin's arrival is the first of many."